Field of corn, Aurora Nebraska. Phone snap. 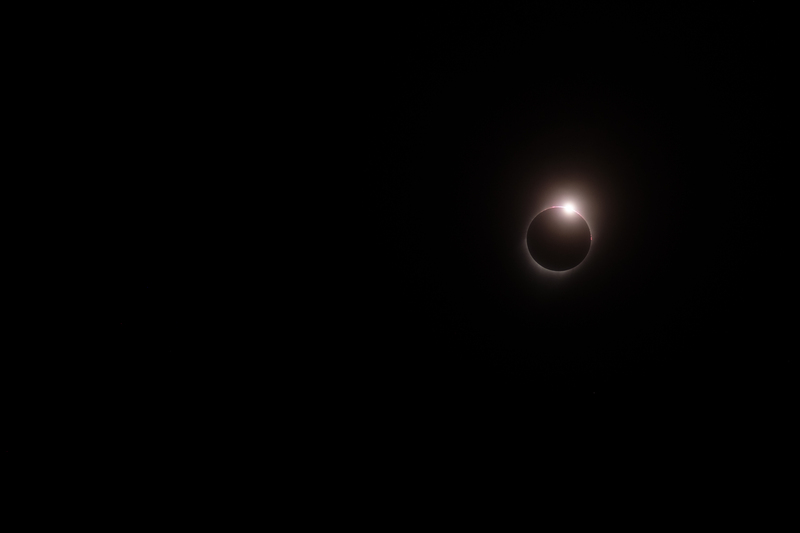 (this was taken from the shuttle bus as it left the viewing event after totality. The weird lighting is a combination of tinted windows and the fact that the eclipse is ongoing – the sun gradually being uncovered following totality – at the point I took this the sun was a crescent again). Corn. Mile after mile of corn. 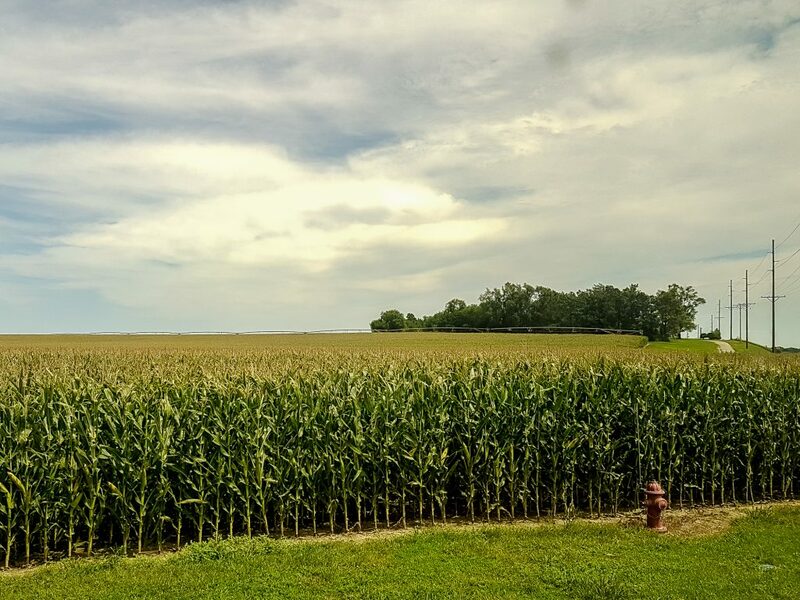 I had been to The Cornhusker State previously but it had been 23 years before and at an earlier time in the year when the corn was less apparent in the fields. After our concerns about “carmageddon” on the roads due to crazy eclipse crowds we actually had a very smooth journey from Thornton, Colorado to Hastings, Nebraska. 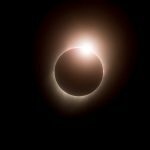 We had a hotel room booked for the night before the eclipse and the plan was then to continue on the little way to the town of Aurora next day to watch the action – or if carmageddon occurred we would most likely stay put at Hastings. After the dry air of Colorado the humidity in Hastings came as a bit of a shock and the skies were almost totally clear – a good omen for the following day. We had most of a day to kill so we looked around the campus of Hastings College where my wife had studied back in the day. I had visited here myself on one occasion and that was during my previous visit to Nebraska all those years before. It was amazing how clearly I remembered the place. We also had a wander around the town and the market stalls which had been put up as part of “SolFest“, the town’s celebration of the solar eclipse. It was a great atmosphere and expectations were running high for the following day. 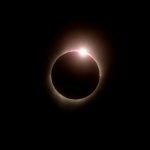 August 21st dawned, the day of the eclipse. There was quite a lot of cloud about. We had two choices – drive around trying to find clear skies or head to Aurora as we had originally intended – and just hope we would be lucky. You could spend all day driving around trying to find the perfect conditions and still be defeated by the weather and my wife had friends (Dan and Tracy) who were running the Aurora eclipse viewing event – they were staying put and hoping for the best so that was what we did too. The event had been organised at The Leadership Center, Aurora. Some folks had camped overnight but for those driving in on the day a free shuttle-bus service had been arranged, running from a nearby ball park where we left the car. Arriving at the Leadership Center we chose our spot in the shade of a couple of trees and I got my camera ready. I have to say I was very impressed with the event planning. Dan was providing a commentary during key phases of the eclipse but not so much that it detracted. Food and drink was available to buy at a very reasonable price with the proceeds making a contribution to the funding of the event. There was no charge for use of the shuttle bus and no charge for entrance to the event. Solar filter in action shooting the eclipse. We still had concerns about the clouds. 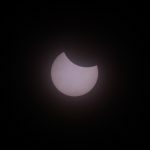 At first we had a clear view of the sun but that was something which was constantly changing, we would just have to hope. It seemed like we had been there for quite a while before I noticed the first sliver of the sun had been eaten away – first contact. From then on I was taking shots at regular intervals. 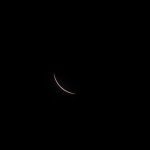 I was bracketing my exposures to try and make sure I got at least something. 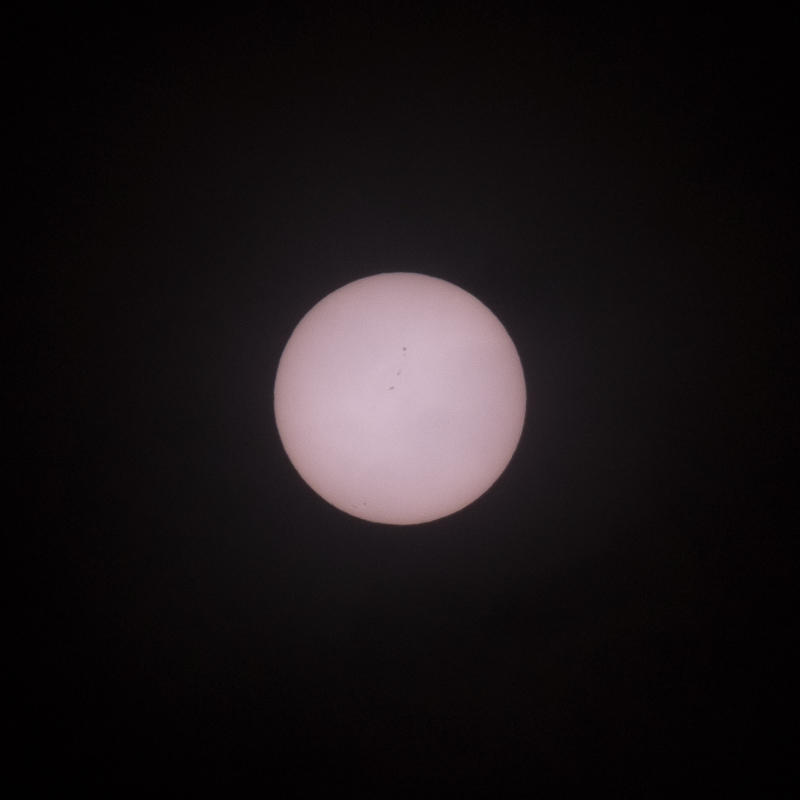 The filter was working well and I was getting a good view of the ever diminishing solar disc but the clouds were quite variable and although most of the time we could make out the sun behind them I was having to adjust my exposures quite dramatically to compensate. It was difficult to notice the light levels dropping around us, it was so gradual. At one point I noticed that the cicadas had started chirruping as they do in the evening, a sure sign it was getting darker. 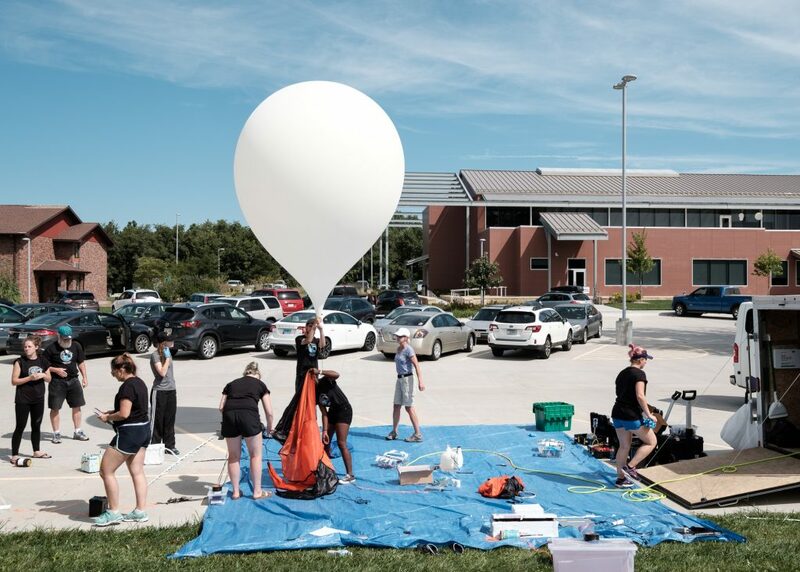 A weather balloon being prepared for launch. 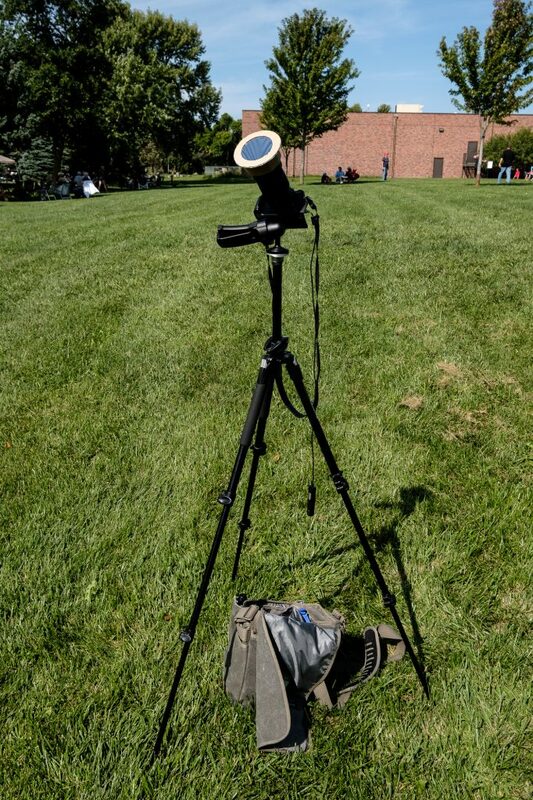 Measurements being taken of atmospheric changes during the eclipse. We were very lucky. Just moments before totality was due the clouds cleared enough for us to get a really good view. 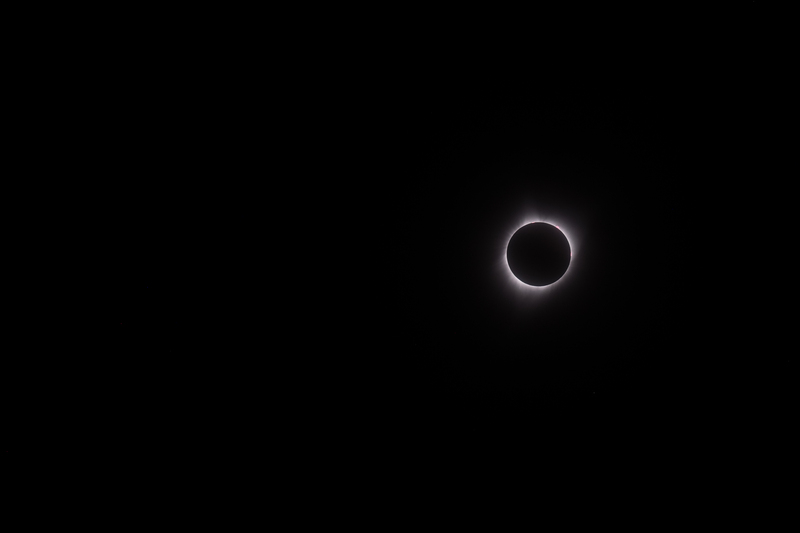 It was amazing just how bright it was right up until totality and then suddenly the light level fell to something similar to twilight as a “black hole” appeared where the sun used to be. 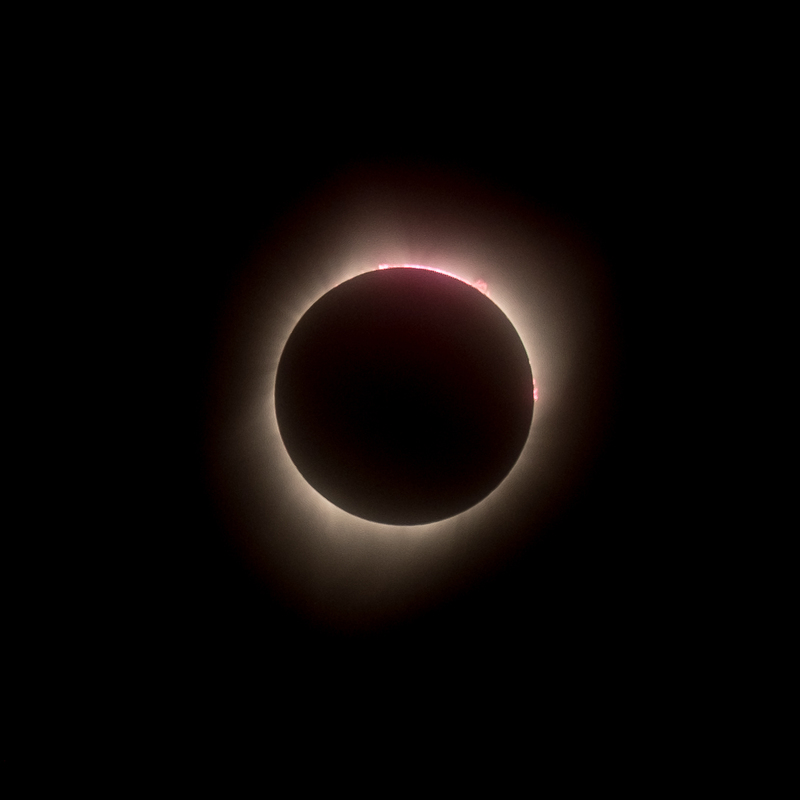 I really don’t think any words, photographs or video can possibly do justice to the beauty and other-worldliness of witnessing a total eclipse. I felt like I was in a science fiction movie or a surrealist painting. 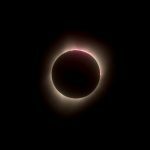 We were in the shadow of the moon, the sun was a black hole above us with a rim of glowing plasma, stars and planets were visible in the sky during daytime and there was a 360 degree sunset extending all around us. 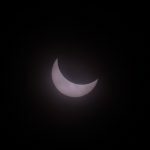 During totality there is no need for protective glasses or for my solar filter over the lens. I slid it off and carried on shooting whilst also trying to take in every moment of the experience. 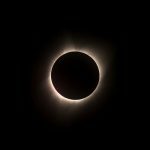 It was true that no photo could adequately convey what it felt like but I had come all this way and I was prepared the best I could be so I fired away with my Fuji X-T1 and did the best I could. Yes, I needed a longer lens. 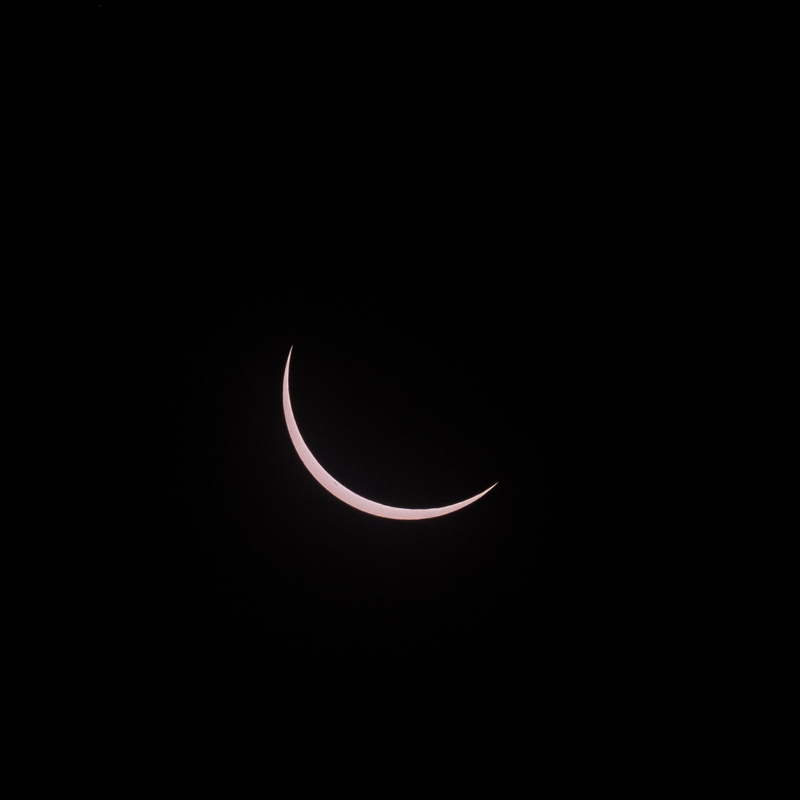 A much longer lens. In hindsight maybe I would have been a little better off taking my EOS 7D with me just for the eclipse. That would have given me an effective 460mm (ish) instead of 300mm. What I really needed was a telescope. 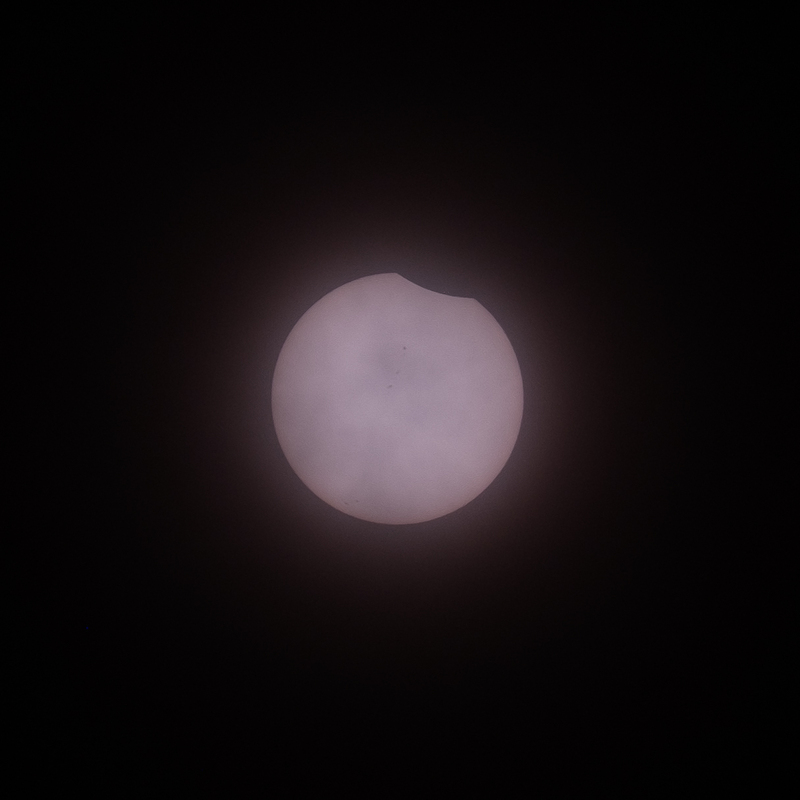 But I had what I had in terms of photographic kit, that decision had been made weeks before we left England and the most important thing was to experience the eclipse first hand, try to remember everything about it as clearly as I could. I’m delighted that I was able to capture the photos below, inadequate as they are, I had to crop quite heavily due to my short focal length (click to see them larger). They are part of my memory of a unique event. It would be wonderful if I got the chance to see another total solar eclipse but I feel so fortunate to have witnessed one during my life and to have managed to capture anything at all on camera is a bonus. 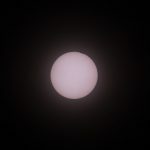 I was delighted that my DIY solar filter worked so well, much better than I ever expected it to. 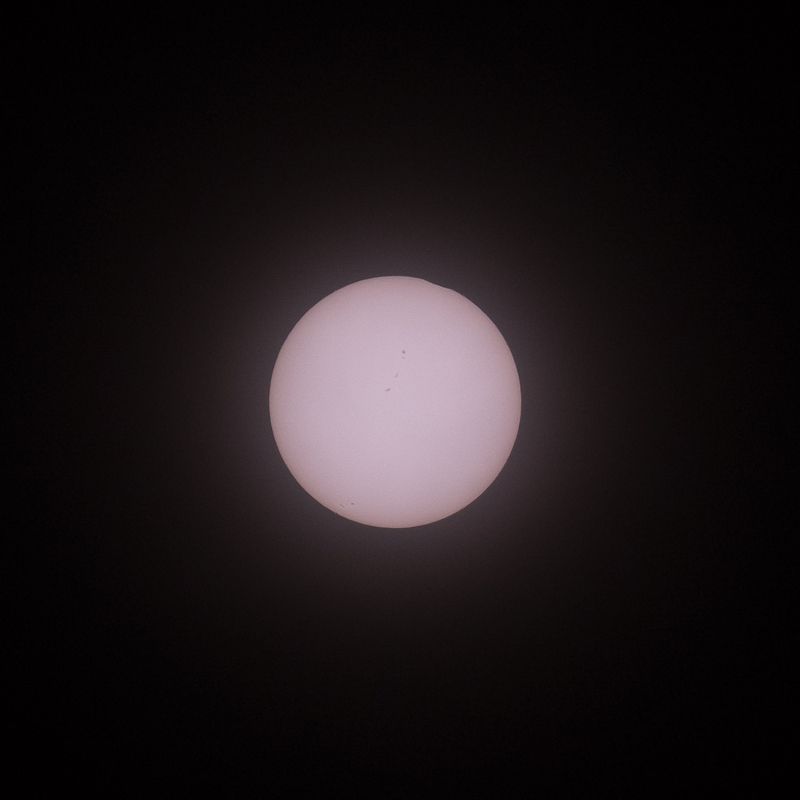 Before the eclipse started, a complete solar disc. 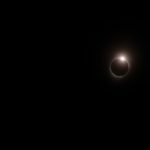 A tiny sliver of the sun is missing – first contact. Very obvious now, but the clouds are evident. Totality. Note the prominence to the top right. 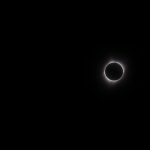 Totality without the cropping. This is what I saw through my viewfinder. Diamond ring without the cropping. Diamond Ring glowing brighter, a moment later it would be over.